How to access Linux Ext4/Ext3/Ext2 partition from Windows 10/8/7? Position : Tips - How to access Linux Ext4/Ext3/Ext2 partition from Windows 10/8/7? This guide shows how to access Linux Ext2/Ext3/Ext4 partition from Windows 10/8/7/Vista/XP via Windows partition manager. If you dual boot your computer with Windows and Linux, you'll be able to access NTFS or FAT partition under Linux, but you cannot access Linux partition under Windows. If you need to mount Linux partition under Windows without booting into Linux, here is the tutorial that can help you. How to mount Linux Ext4/Ext3/Ext2 partition in Windows? How to read files in Linux partition under Windows? How to write data in Linux Ext4/Ext3/Ext2 partition from Windows? "My computer is in a dual-boot environment with Windows 10 and Ubuntu. They are installed on one hard drive which is divided into two partitions C and D. Sometimes I want to grab files from Linux partition while computer has booted into Windows 10. It's way too trouble to restart into Linux and copy files to FAT partition and reboot back into Windows. Anyone here knows how to access Ext4 partition from Windows 10?" If your computer is dual-booting with Windows and Linux, you must have trouble in accessing files and folder stored in Linux partition while Windows is running. The default file system type used on Windows and Linux are different, Windows users NTFS and FAT, while Linux employs ext2, ext3 and ext4 file systems. Besides, Linux has support for NTFS and FAT file system, which enables users to access files on Windows partitions. However, on the other hand Windows does not have inbuilt support for Linux partition. Therefore, you may come across such a situation if you are using Windows and Linux together on a computer. You may need to use some files you downloaded in Linux, and you are logged into Windows OS already. Since you cannot access Linux partition directly, you'll have to restart computer and boot to Linux, copy these files to a NTFS or FAT partition and then reboot computer to Windows. Wouldn't it be better if you can access Linux partition from Windows? Nowadays, many users would like to dual boot Linux and Windows on one PC, and they often need to transfer data between two systems. Since Windows does not provide built-in tool to mount Linux partition, we need to use third-party software to read & write data in Linux partition. This article will introduce an effective tool to solve the problem. Keep reading the guide, you'll be able to know how to mount and access files in Linux partition under Windows. Some readers may wonder what a file system is. A file system is a system method to control, store, retrieve and organize files on a storage device. Why are there so many file system types? Different operating systems use and support specific types of file system, for they target different users. For instance, Windows NT targets enterprise users and uses NTFS file system which enhanced security greatly; Windows 9X targets ordinary users and uses FAT file system which has less security but more performance. As we all know Windows and Linux uses different file system: Windows uses NTFS, FAT, FAT32 file system, whereas Linux uses Ext2, Ext3 and Ext4. Thus, users cannot copy a file from Linux to Windows. It is quite complicated for an OS to add support of a particular file system, especially adding support for proprietary file system. For example, the structure of data on dis, encryption algorithm and so on of NTFS file system are not known to the public, and it is very challenging to fully support NTFS in Linux. Windows does not have native support for Linux file system like Ext2, Ext3 and Ext4. However, some tools have been created to solve this issue. Such software supports Linux file system and allows users to access Linux partition under Windows. The follow section will introduce a Windows partition manager that can mount and access Linux partition from Windows. If you have Windows and Linux on same PC and want to access data of Linux partition under Windows, then you need to use third-party software to read & write ext partition. Here we recommend Eassos PartitionGuru Pro to help you solve the problem. Eassos PartitionGuru Pro is advanced Windows partition manager and data recovery software. It can handle partitions formatted as NTFS, FAT32, FAT12, Fat16, exFAT, Ext2, Ext3 and Ext4 file system from Windows. Mounting Linux partition in Windows is the first step before we can read & write data in the volume. 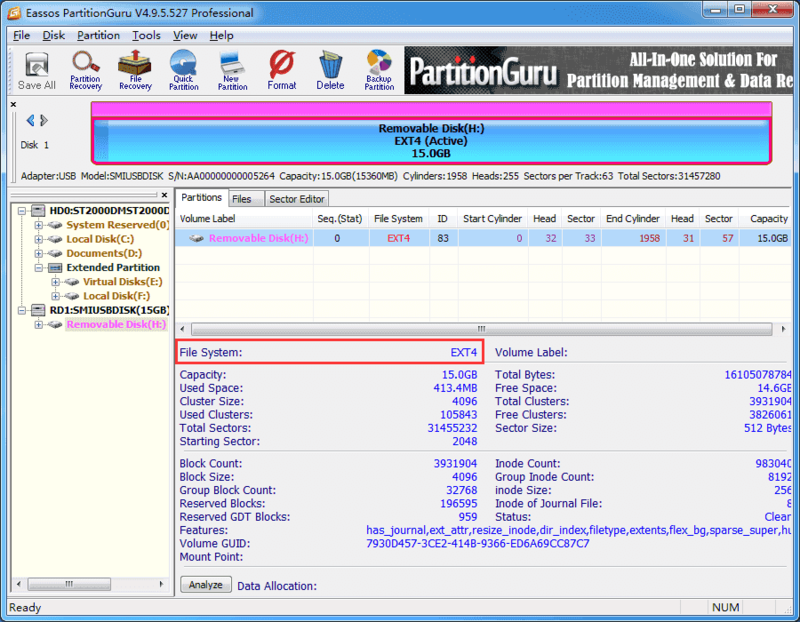 Now we can use Eassos Partition to mount Linux partition. Step 1 Connect the hard drive that contains Linux partition to your computer and boot your PC into Windows. Step 2 Download and install Eassos PartitionGuru on your PC and then launch it. Step 3 Once the Windows partition manager is launched, you can view all disks and partitions attached to this machine. Select the Linux partition and you can browse files and folders in it. Step 4 Select the Linux partition and click Files tab, and you can see data in the root directory. Then you can double click folders to open it and view files in it. Once the Linux partition is mounted by Eassos PartitionGuru, you can read & write files in the partition via the software. File path and directory is listed in the left pane like Windows Explorer and you can click path here and view files on the right pane. You can double-click a file to open it and view file content in its original size. This tool supports preview photos, audio, video, documents (pdf, word, excel, ppt, etc. ), text files. Step 1 Open the folder that you want to add data and right-click empty space on the right pane to choose "Copy Files To Current Partition"
Step 2 Select files from other partition or hard drive from your computer and Open. Wait for a while, and files will be copied to this Linux partition. This software also allows users to copy files in Linux partition to other Windows partition on this computer: Select files you want to copy -> right-click files and select "Copy To"
Step 1 Select files you want to delete and select "Delete Files Permanently" option from context menu. Step 2 Click Permanently Delete button on the popup window. Step 1 Right-click on a file or folder you want to change name and select Rename. Step 2 Put in the desired name and click OK button. Eassos PartitionGuru is a handy and versatile Linux reader for Windows and you can access your Linux partition from Windows. It supports full access to Ext2, Ext3 and Ext4 partition, as well as manages Linux partitions to get best use of disk space. If you are the dual-boot user, PartitionGuru will be your best assistance.